The prevalence of the herbal medicines use is on the rise across the world, especially amongst pregnant women. The scenario in the Middle Eastern region was reviewed to explore the prevalence, usage pattern, motivation, and attitude towards use of herbal medicine by pregnant women. Literature published up to December 2012 showed the prevalence of herbal medicine use varied between 22.3–82.3%, implying a rising trend in the utilization of herbal medicine during pregnancy. The most common herbs used were peppermint, ginger, thyme, chamomile, sage, aniseed, fenugreek, and green tea. The most common reasons for use included the treatment of gastrointestinal disorders and cold and flu symptoms. The majority of women used these products during their first trimester, and did not reveal this information to their physician. Most women were advised by family and friends to use herbal medicines and believed they were more effective and had fewer side effects than modern medicine especially during pregnancy. In conclusion, the use of herbal medicine is prevalent among pregnant women in the Middle Eastern region and healthcare providers need to seek information pertaining to their use. 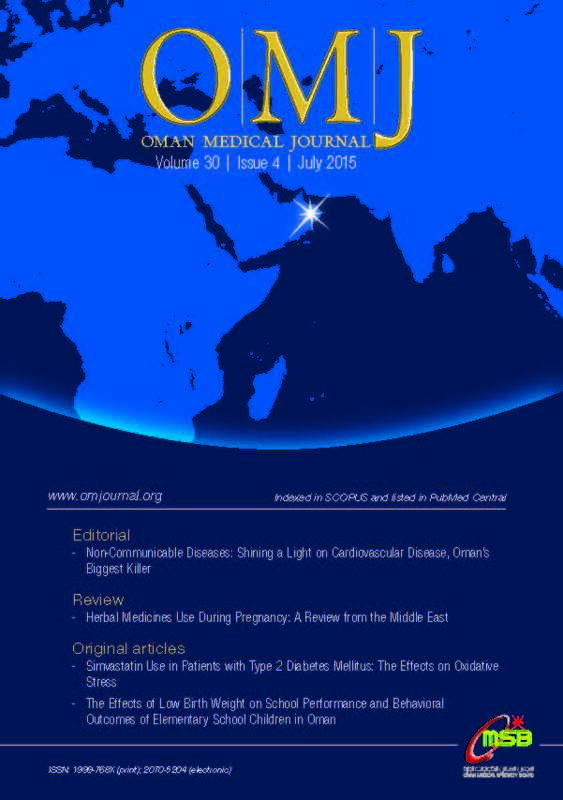 Keywords: Herbal Medicine; Pregnancy; Middle East. Objectives: Studies have shown that people with type 2 diabetes mellitus (T2DM)may develop atherosclerosis due to the disturbance in oxidative control and progressive dyslipidemia. Our study aimed to highlight the benefits of simvastatin treatment in improving serum lipids and reducing oxidative damage in patients with T2DM. Methods: Our randomized control trial included 56 patients with T2DM and dyslipidemia. The participants were on glibenclamide (5mg/day) during the period of the study. The patients were divided into two study groups (groups 1 and 2). Group 1 was the control group and consisted of 31 patients. Group 2 consisted of 25 participants, who were given simvastatin 20mg tablet once daily for 12 weeks. The control group did not receive simvastatin. Both groups were followed-up for measurement of blood pressure, pulse rate, serum lipids, and parameters of oxidative stress. Results: The simvastatin treated group showed a significant improvement with reduced erythrocyte glutathione compared to the control group (p<0.001). This was also associated with a significant reduction in erythrocyte malondialdehyde in the simvastatin treated group compared to the control group (p<0.001). Serum lipids reflected a similar improvement in the levels of erythrocyte malondialdehyde. Conclusions: Our study highlights the beneficial role of simvastatin in improving the degree of oxidative stress in patients with T2DM through its effects on serum lipids and lipid peroxidation. Objectives: Postoperative nausea and vomiting (PONV) is the most common complication seen following laparoscopic surgery. Our study sought to evaluate the efficacy of the newer drug palonosetron with that of ondansetron, in combination with dexamethasone, for PONV in patients undergoing laparoscopic hysterectomies. Methods: A total of 90 patients, aged between 30–50 years old, posted for elective laparoscopic hysterectomies under general anesthesia belonging to the American Society of Anesthesiologist (ASA) physical status I and II were included in the study. Patients were randomly divided into one of two groups (n=45). Before induction, patients in the first group (group I) received 0.075mg palonosetron with 8mg dexamethasone and patients in the second group (group II) received 4mg ondansetron with 8mg dexamethasone. Postoperatively, any incidences of early or delayed vomiting, requirement of rescue antiemetic, and side effects were recorded. Patient’s hemodynamics were also monitored. Statistical analysis was done using Student’s t-test, chi-square test, and Fisher’s exact test. Results: Preoperative, intraoperative, and postoperative heart rate, mean arterial pressure, peripheral capillary oxygen saturation were statistically not significant (p>0.050) in either group. In group II, eight patients had nausea in the first two hours and three patients had nausea in the two to six-hour postoperative period. In group I, three patients experienced nausea in the first six hours period. Eight patients in group II had vomited in the first two-hour period compared to one patient in group I (p=0.013). The requirement of rescue antiemetic was greater in group II than group I (20% vs. 4%). No side effects of antiemetic use were observed in either group. Conclusion: The combination of palonosetron with dexamethasone is more effective in treating early, delayed, and long term PONV compared to ondansetron with dexamethasone in patients undergoing elective laparoscopic hysterectomies under general anesthesia. Objectives: Improvements in perioperative pain management for lower abdominal operations has been shown to reduce morbidity, induce early ambulation, and improve patients’ long-term outcomes. Dexmedetomidine, a selective alpha-2 agonist, has recently been used intrathecally as adjuvant to spinal anesthesia to prolong its efficacy. We compared two different doses of dexmedetomidine added to hyperbaric bupivacaine for spinal anesthesia. The primary endpoints were the onset and duration of sensory and motor block, and duration of analgesia. Methods: A total of 100 patients, aged 35–60 years old, assigned to have elective abdominal hysterectomy under spinal anesthesia were divided into two equally sized groups (D5 and D10) in a randomized, double-blind fashion. The D5 group was intrathecally administered 3ml 0.5% hyperbaric bupivacaine with 5µg dexmedetomidine in 0.5ml of normal saline and the D10 group 3ml 0.5% bupivacaine with 10µg dexmedetomidine in 0.5ml of normal saline. For each patient, sensory and motor block onset times, block durations, time to first analgesic use, total analgesic need, postoperative visual analogue scale (VAS) scores, hemodynamics, and side effects were recorded. Results: Although both groups had a similar demographic profile, sensory and motor block in the D10 group (p<0.050) was earlier than the D5 group. Sensory and motor block duration and time to first analgesic use were significantly longer and the need for rescue analgesics was lower in the D10 group than the D5 group. The 24-hour VAS score was significantly lower in the D10 group (p<0.050). Intergroup hemodynamics were comparable (p>0.050) without any appreciable side effects. Conclusions: Spinal dexmedetomidine increases the sensory and motor block duration and time to first analgesic use, and decreases analgesic consumption in a dose-dependent manner. The quality and duration of sleep is impaired during pregnancy. Our study aimed to determine whether maternal sleep deprivation occurring during the second and third trimester of pregnancy could alter fetal well-being with respect to birth weight and APGAR score by altering the inflammatory status and oxidative stress in the mothers. Method: Sleep adequacy was assessed using the Pittsburgh Sleep Quality Index (PSQI). We investigated the inflammatory status and oxidative stress at term in the blood of pregnant subjects with and without sleep deprivation by measuring the levels of protein-bound sialic acid (PBSA), high-sensitivity C-reactive protein (hsCRP), malondialdehyde (MDA) and protein carbonyl (PCO). Homocysteine (Hcy) and its vitamin determinants were also measured. Fetal outcome with respect to birth weight and APGAR score were compared between study subjects. Results: A significant increase was observed in the levels of hsCRP, PBSA, Hcy, MDA, and PCO, in the sleep-deprived group when compared to the control group. Fetal outcome at birth showed a significant difference between the cases with high sleep deprivation and those with low sleep deprivation. Conclusion: Sleep deprivation in pregnancy leads to an increase in the inflammatory parameters, oxidative stress, and Hcy levels. Fetal outcome at birth was affected more in mothers with high sleep deprivation than those with low sleep deprivation. Follow-up in these babies are needed to reveal any differences in their growth and development. Objectives: The diagnosis of pain in patients with low consciousness is a major challenge in the intensive care unit (ICU). Therefore, the use of behavioral tools for pain assessment could be an effective tool to manage pain in this group of patients. The aim of this study was to determine the effects on pain management by nurses using a critical care pain observational tool in patients with a decreased level of consciousness. Methods: Our research used a before and after design to evaluate the ability of nurses to manage pain in patients with low consciousness. A total of 106 ICU nurses were included in the study. The study was divided into three phases: pre-implementation, implementation, and post-implementation. The researchers first observed the nurses management of pain in their patients; this was done three times using a checklist following tracheal suctioning and position change procedures. The nurses were then taught how to apply the critical-care pain observational tool (CPOT). Post-implementation of the tool, the researchers re-evaluated trained the nurses’ pain management. Result: Performance scores after training improved with relation to the nurses diagnosis of pain, pharmacological and nonpharmacological actions, reassessment of pain, and re-relieving of any pain. However, use of the tool did not improve the recording of the patient’s pain and the relief measures used. Conclusion: Use of the CPOT can increase nurse’s sensitivity to pain in non-conscious patients and drive them to track and perform pain management. Pulmonary pneumatocele is a thin-walled, gas-filled space within the lung that usually occurs in association with bacterial pneumonia and is usually transient. The majority of pneumatoceles resolve spontaneously without active intervention, but in some cases they might lead to pneumothorax with subsequent hemodynamic instability. We report two cases presented to the pediatric intensive care unit at the Royal Hospital, Oman with pneumatoceles. The first was a 14-day-old baby who underwent surgical repair of total anomalous pulmonary venous connection (TAPVC) requiring extracorporeal membrane oxygenation (ECMO) support following surgery. He was initially on conventional mechanical ventilation. Seven days after the surgery, he started to develop bilateral pneumatoceles. The pneumatoceles were not regressing and they did not respond to three weeks of conservative management with high-frequency oscillation ventilation (HFOV). He failed four attempts of weaning from HFOV to conventional ventilation. Each time he was developing tachypnea and carbon dioxide retention. Percutaneous intercostal chest drain (ICD) insertion was needed to evacuate one large pneumatocele. Subsequently, he improved and we were able to wean and extubate him. The second case was a two-month-old male admitted with severe respiratory distress secondary to respiratory syncytial virus (RSV) pneumonitis. After intubation, he required a high conventional ventilation setting and within 24 hours he was on HFOV. Conservative management with HFOV was sufficient to treat the pneumatoceles and no further intervention was needed. Our cases demonstrate two different approaches in the management of pneumatoceles in mechanically ventilated children. Each approach was case dependent and could not be used interchangeably. Angioleiomyomas are infrequent benign tumors originating from smooth muscle cells of arterial or venous walls. They are most commonly seen in the lower extremities with a prevalence of only 8.5% in the head and neck. We present the case of a 40-year-old male patient who presented to Christian Medical College, Vellore, India, with recurrent episodes of right-sided epistaxis. A computed tomography scan showed an enlarged right inferior turbinate filling the right nasal cavity. The mass was removed endoscopically and sent to pathology. A diagnosis of angioleiomyoma of the nasal cavity was made. This location that has only been described in a minority of cases in the literature. Our case report signifies the importance of maintaining a broad differential when dealing with patients presenting with nasal mass and the importance of histopathological examination for the diagnosis.